In any given size reduction application, the specific properties of the material being processed play a key role in how finished particle size reduction is achieved. Hardness, brittleness, moisture content, oil content, etc. are all considered when determining not only the appropriate style of size reduction equipment, but also the configuration of the equipment's internal components. 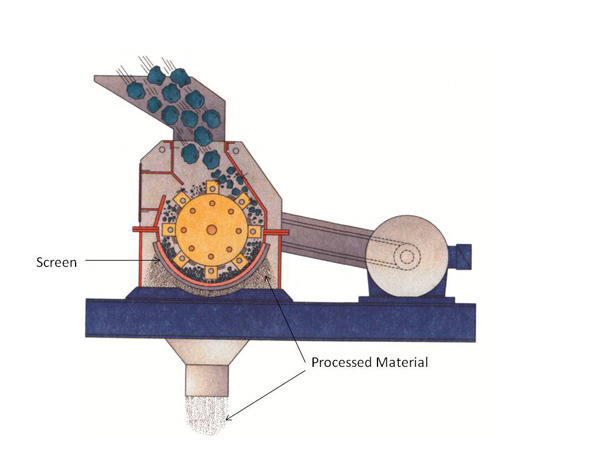 In the majority of hammer mill applications, the key factor determining finished particle size is the the screen. Any material that enters the grinding chamber must be reduced to a size small enough to pass through the screen that covers the mill's discharge opening. Because of this the screen size provides 70% of the control over the finished particle size. Size reduction takes place when material is fed into a hammer mill's grinding chamber and it is repeatedly struck by flailing ganged hammers that are attached to a rotor spinning at very high speed. A combination of hammer blows, collision with the walls of the grinding chamber, and particle on particle impact reduce the material until it is able to pass through the screen. Screens and bar grates are constructed from steel and are available with perforations (screens) or spaces (bar grates) in a broad range of sizes. Screen size is determined by the size of the openings in the screen, and is described in the following units of measure: inches, millimeters, microns (one millionth of a meter), and US mesh (the number of wires running east/west and north/south in one square inch of screen). The appropriate screen size is determined by the desired finished particle size, and the properties of the material being processed. That is, characteristics such as friability and moisture content have an effect of the manner in which a material will break down. As a result, using the same screen to process materials of different properties will result in a range of different finished particle sizes. This variation is called particle size distribution, and it is based on the the individual properties of the materials being processed. In this example: Glass is very friable, and will shatter very easily upon impact. In comparison, green wood chips are a fibrous material with a moisture content of up to 50%, which both effect the ease with which they are reduced. Finally, computer hard drives are very hard and comprised mostly of metals, making them comparatively hard to process and unlikely to breakdown beyond the screen or bar grate size. But screen size only accounts for 70% of what determines the finished particle size. The reamining 30% is attributed to the force of the impact on the material being processing. In the case of hammer mills, force is determined by rotor speed, and the size and number of hammers. Rotor Speed: Slowly tap the glass with a hammer and it will break into perhaps 3 to 4 large pieces. Conversely, if you hit it with the same hammer at a rapid speed, it will break into many more, much smaller pieces. Hammer Size: Strike a water glass with a butter knife, and it will break into a few large pieces. Strike the same glass with a sledge hammer, and it will shatter into 1000+ pieces. Finished particle size is determined by a combination of screen size, rotor speed, and the size and number of hammers. Material must remain in the grinding chamber until it is able to pass through the screen covering the hammer mill's discharge opening. Optimal screen size is determined by the desired finished particle size, and the properties of the material being processed.